Highly recommended for asthmatics and those undergoing radiation and chemotherapy. NAC repairs the lining of the lungs and is a powerful antioxidant in the prevention of viral diseases. Useful for protecting the liver, it breaks up pulmonary and bronchial mucus. N-acetyl-cysteine, a sulfur containing free form amino acid, is a precursor for our body's most powerful antioxidant, glutathione in the body and has been used to boost glutathione levels in cells. 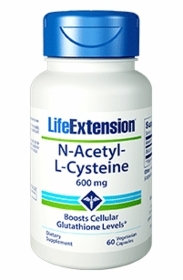 N-acetyl-cysteine is a more stable and effective antioxidant than L-cysteine, being the acetylated form of cysteine which provides for better absorption. It is an antioxidant that has been used to combat viruses, as a liver protectant and to break up pulmonary and bronchial mucus. Other ingredients: vegetable cellulose (capsule), rice bran extract. Dosage and Use: Take one capsule one to three times daily with or without food, or as recommended by a healthcare practitioner. Caution: Those who supplement with NAC should drink 6 to 8 glasses of water daily in order to prevent cysteine renal stones. Cysteine renal stones are rare but do occur.